This project by Melie Ekunno from UWC Adriatic aimed to introduce the practice of recycling to Nigerian cities as a solution to the hygiene challenges in these cities and as a way to care for the environment and promote sustainability through youth involvement and public awareness. The 2017 Global Liveability Report by the Economic Intelligence ranked Lagos, Nigeria’s most populated city, as the world’s second least liveable city. While some Nigerians refuse to believe that the report contains any truth, there are others who agree with its claims. Many might say that the report fails to recognise the spirit of the city and the beauty of her people – as Nigerians have in the past been ranked as the world’s happiest people. However, it does point out to the reality of political and socio-economic challenges which, perhaps, Nigerians have grown to accept. Nigerians have learnt that the environment can be pushed, poked, bullied, stolen from, ravaged and made to shut up about it simultaneously. This project was developed to change this belief and educate children on the importance of caring for the environment and how recycling can make a difference. 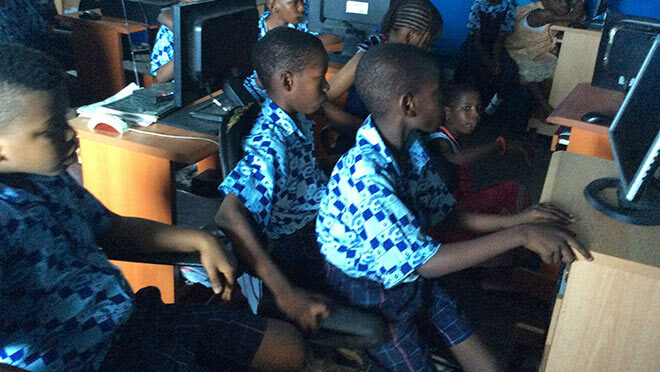 Working with school children of all ages in both rural and suburban settings, Melie taught them about the environment using videos, hands-on activities (art workshops with recyclables) and a mascot! The entire project lasted just over six weeks. 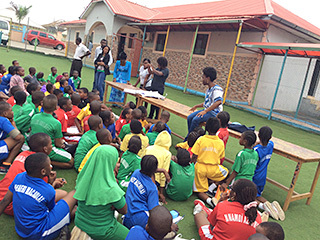 Working with children in six schools, including First Age private schools, Efab schools, Cathrina International School, Eli’s Angels schools, Excellent grade and Unity Montessori Basic school, the children ranged from nursery school aged to secondary school aged children. Videos were used to aid their understanding of climate change, global warming and recycling. Workshops were held with recyclable materials at some of the schools. 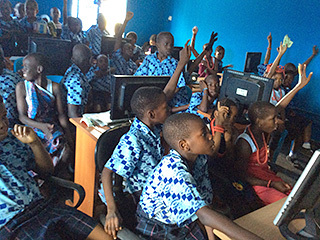 It was emphasized that although the greater responsibility of caring for the environment falls to adults and governments, children and young people still have important roles to play such as educating their peers, saving electricity when possible and recycling. 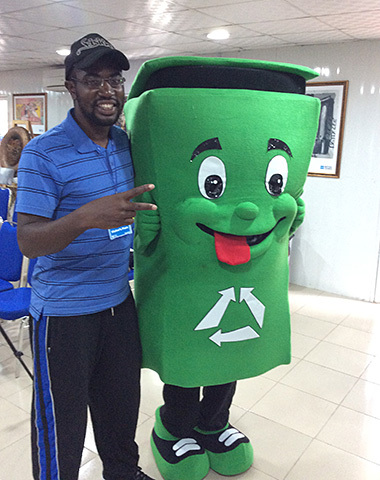 To help re-enforce the message to younger children, a recycle bin mascot (Baba Bin, pictured above) was used, who made learning about recycling fun for the children. The greatest impact this project had is the knowledge left the children with; the seed of inquiry sown in their minds and an attitude of concern for the environment. Many of the school administrators showed great interest in continuing with the project’s goals and to that respect, they asked that I continued with the sessions at their schools even into the next school year. Lessons learned in delivering this project included the importance of understanding the best time to deliver the project to get maximum impact, a recognition that not everyone would be as willing and enthusiastic within the schools to take the project forward on their own, and that more could have been achieved if this project was delivered with a project team rather than by one person. This project helped me to understand that, even though it might be tempting to dismiss as cliche, I could do anything if I set my mind to do it and take the necessary steps. I learnt to have more faith in humanity as I got to meet a few people who were also working to educate about and care for the environment.